For Thomas Beatty, high recognition for his career achievement. LOCKPORT – Niagara County Sheriff’s Chief Administrative Deputy Thomas C. Beatty is known for working behind the scenes to get things done. But he recently found himself in the spotlight as he received the state’s top award for career achievement. Sheriff James R. Voutour, who nominated Beatty for the Carl Draxler Award, said that it is the most prestigious honor bestowed by the New York State Sheriffs’ Association. Beatty, 57, has been with the department for 36 years, serving under four sheriffs. As administrative chief he also serves as the liaison to the Niagara County Legislature, where his recommendations have led to legislative actions and economies that have saved taxpayer money. His lengthy tenure has made him the go-to guy on almost every topic, according to Voutour. He said the oft-heard refrain around the Sheriff’s Office is, “Ask Chief Beatty, he’ll know.” And he does, Voutour said. “He such a dedicated worker. He studies everything and knows every regulation we have to follow. All those different standards, he knows by heart. He’s a very humble, low-key guy,” Voutour said. Among the Sheriff’s Office initiatives that Beatty is credited with presenting to county legislators is one to save money by fighting welfare fraud, which yielded hundreds of thousands of dollars in savings. He also obtained at no cost to taxpayers a $360,000 state-of-the-art mobile command post. Most important, Voutour said, was $2 million in grant money he obtained for the $10 million 911 center, which would give the county one dispatch center serving the entire county. “Accreditation is very important, and the Niagara County Legislature is proud of Tom and the sheriff and all his men and women for achieving that,” Godfrey said. Beatty earned an associate’s degree from Niagara County Community College and a bachelor’s degree in criminal justice from Niagara University. He graduated from the Niagara County Law Enforcement Academy. In 1986, he was promoted to captain, and in 2009, he was named chief deputy, the third-highest position in the department. 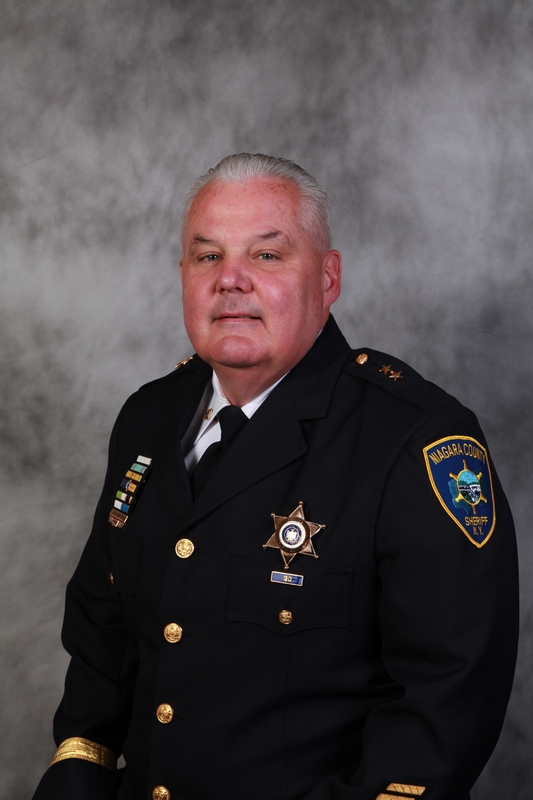 Beatty has received a number of individual honors, including the Niagara County Sheriff’s Distinguished Service Award for outstanding service and dedication, and the department’s Craig C. Harmon Award for commitment to excellence to duty, family, community and co-workers. He also was the first recipient of the New York State Division of Criminal Justice Services John Kimball O’Neill Certificate of Achievement for dedication and professionalism displayed in managing complex program files for successful reaccreditation. Voutour said Beatty has never been interested in personal acclaim. But he said law enforcement and the quality of life for the people in Niagara County have been enhanced because of Beatty’s professional abilities and personal qualities. He’ll also give you the shirt off your back – or in this case the sport coat, his co-workers say. Chief Operational Deputy Steven C. Preisch said that after left the Air Force and returned home, he was working two jobs while attending NCCC taking criminal justice. “I applied for a scholarship, and I ended up receiving it. (Beatty) said there will be a picture. ‘I want you to cut your hair and wear a sport coat,’ he said. I told him I didn’t own one,” said Preisch, who was helping to support his mother at that time, as well. Voutour said Beatty played a big role in his career, too. He said that after the death of Sheriff’s Deputy Jeffrey A. Incardona in 1993, he was encouraged by Beatty, who was a captain at the time, to leave his job with the Jamestown Police Department and return to the area to fill the open position. Voutour said that at first he said no, but Beatty insisted. “I finally listened to him and came back here as a sheriff’s deputy in 1993,” the sheriff said.